Trial dates are set, and it’s a critical hour for our legal efforts. On August 13, Chase Iron Eyes will walk into a North Dakota courtroom and face prosecution for his alleged crimes. The charges? Trespassing on the Lakota’s own sacred land and inciting a riot — when a group of 74 unarmed water protectors peacefully withstood a raid of Last Child’s Camp and subsequent arrest at the hands of fully armed law enforcement officials. Thankfully, Chase has a dedicated team in his corner. 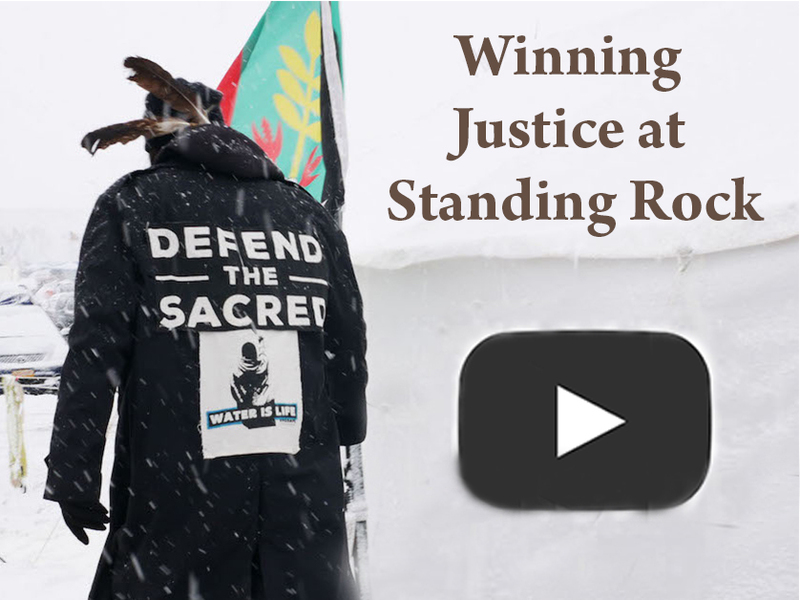 You are among a group thousands strong who stood with Standing Rock in its hour of need, who have followed this story to the courts, and who have taken repeated action to keep the fight for justice on track. Now, in order for that justice to be served, we need your financial support. Our legal team must — and will — gather a staggering amount of evidence in the coming months. This includes more than 50 depositions, requiring travel to Texas and North Carolina to question, under oath, officials of Dakota Access pipeline parent company Energy Transfer Partners and their hired mercenary security firm, TigerSwan. In preparation for this moment, the Lakota People’s Law Project staff has spent the past several decades combining investigation, litigation, education, and organizing to create solutions for social reform in the US. Once again, we’re ready to challenge injustice. This time, we are confronting racism and violations of the Federal Civil Rights Act and the Environmental Protection Act in support of our First Amendment rights under the Constitution. These landmark legal defenses can set precedents that will safeguard all future protectors of water and land, all those who stand in strength to tear down injustice. This case is being fought for all of us who care about indigenous rights, all of us who care about the First Amendment, and all of us who care about Mother Earth. Your support now can help Chase make history. Wopila — we thank you! P. S. The upcoming trials — and surrounding public education — will not only exonerate our clients; they will expose the injustices perpetrated by state-sponsored private military operations. We will continue to provide updates to you as the team uncovers the truth and explores the extent of the rights violations at Standing Rock. With your continued aid, we will turn the tide in this country at its darkest hour. With your support, we will prevail. The Lakota people’s Law Project is part of the 501(c)(3) Romero Institute, an interfaith law and policy center. All donations are tax-deductible. Former Secretary of State Hillary Clinton told an overseas audience this week that her 2016 election loss came at the hands of “backwards”-looking voters who “didn’t like black people getting rights” or women in the workplace. Talk of FBI investigations and secret email servers was not on the agenda Monday in Mumbai, India, as the author of “What Happened” explained, once again, why President Trump occupies the White House. Mrs. Clinton blamed racists and sexists with an acute hatred for black people. She also cited racism against Indians in her explanation to an Indian audience.